The Dave Chappelle comeback is now complete. After touring with Funny or Die’s summer Oddball Festival amphitheater tour, holding down a residency at Radio City Music Hall and more than a year of theater dates across North America, Chappelle recorded his stand-up for a special over the weekend at Austin City Limits Live at The Moody Theater. Chappelle performed sold-out shows Thursday, Friday and Saturday at the theater in downtown Austin. DJ Trauma and DJ Hype hyped up the crowd, while local stand-ups Ashley Barnhill and Mo Amer got a chance to play to the large, appreciative audiences waiting to see Chappelle. Chappelle also popped into the Speakeasy late Friday night for an afterparty where he riffed with members of Stevie Wonder’s band, in the Texas capitol for a separate show. A friend of The Comic’s Comic attended one of Chappelle’s Saturday shows. 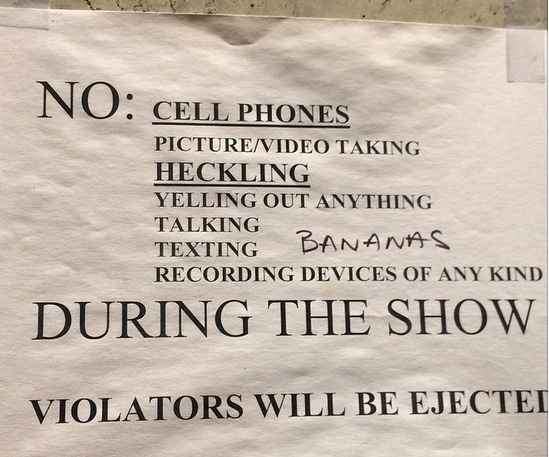 And wouldn’t you know it, that delinquent heckler from New Mexico who threw a banana peel at Chappelle earlier last week got the attention he wanted, as the 41-year-old comedian had plenty of new jokes at his expense. Hopefully those won’t make the final cut for his HBO special, instead leaving room for his more carefully crafted hour-plus of material. It’s reportedly for HBO, reportedly because the cable giant hasn’t announced anything yet. And also, because as we’ve learned from the David Lynch Twin Peaks reboot with Showtime, nothing is official until we see a finished product. Chappelle hasn’t filmed a stand-up special since 2004’s For What It’s Worth, although he also starred in his 2005 documentary, Dave Chappelle’s Block Party. So it’ll be thrilling for anyone who hasn’t seen Chappelle’s live shows over the past couple of years — and for everyone who hasn’t seen him on TV or the big screen in a decade — to finally get a glimpse of his comic brilliance again. We’ll have to wait a little bit longer to see when and where this shows up. Meanwhile, Chappelle’s current stand-up tour continues with at least 28 more dates this month alone. Wasn’t one of his RadioLab dates filmed as well? saw Dave last night at the Ryman in Nashville. Brilliant.